Doug Pederson and Chip Kelly don't exactly see eye-to-eye when it comes to roster construction. 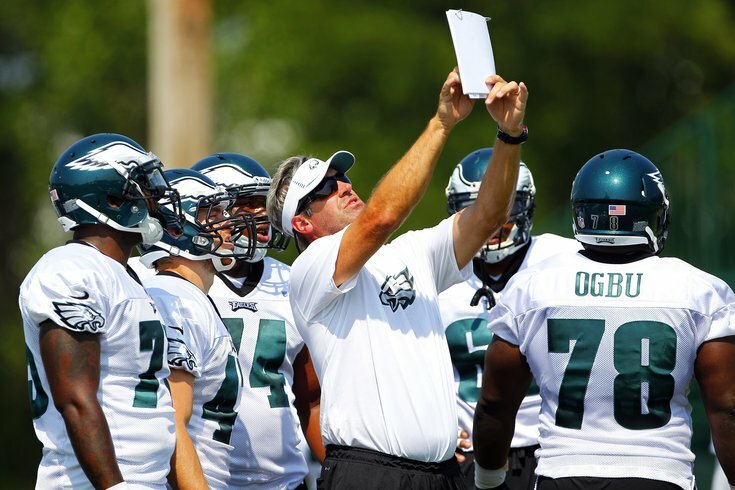 Last offseason, prior to the NFL Draft, Ed Marynowitz -- the Eagles' top personnel evaluator -- laid out his three-tiered approach to finding the right players for his roster. And the first point he brought up had to do with height and weight continuity among positional groups. "Number one, it's the height-weight-speed, according to the position," Marynowitz said back in April of 2015. "That's the one factor of it. They either have that or they don't. It doesn't necessarily eliminate them per se, but that's one element of it. So you'll grade that individually. "The second part is the position specifics, or the critical factors for that position, which is basically the guy's athletic ability to play that specific spot, which is also relative to your system and scheme. Every team is different, so we have certain prototypes for that. The third part is the character, attitude, and intelligence piece, in terms of the right football makeup, and how we want to build the team." Chip Kelly clearly brought this philosophy to the Eagles when he was hired in 2013, but it wasn't until he usurped GM Howie Roseman's control over the roster that we were able to see just how deeply Kelly was entrenched in his desire to maintain a consistent size among players at a certain position. Looking back, it's hard to imagine that this type of thinking -- building your roster based on a certain scheme rather than fitting your scheme to the players you already have -- didn't play a large role in Kelly's greater failures as a coach, and more specifically as a general manager. I think you’re trying to get people that fit into your system, and that’s why you have height and weight and speed parameters that fit your system. There's enough statistical data to support that in terms of players that are playing at a high level, that there's a certain prototype. So our goal there was that although there may be varying degrees of players in terms of an ability standpoint, when the starters come off the field and the backups come in, they all relatively look the same. So there’s a certain prototype at each position. We try to build the same thing here, whether it’s at inside linebacker, outside linebacker, corner, safety. There’s a prototype, and there’s a model that fits what we do. While speaking to reporters at the NFL Scouting Combine on Wednesday, Kelly's replacement, Doug Pederson, was asked whether or not the Eagles will be looking for "prototype players" to fit a certain mold at each position. "Not really," Pederson said. "I want guys who are athletic guys, smart guys. Especially up front. If you can play guard and center or guard and tackle or tackle and tackle, those are guys you want to find. You want guys who can play multiple spots. Same with receivers. You want your X to be able to play the slot or vice versa." And when asked if he'll be looking for guys who are a certain height, weight or speed, Pederson again separated himself from Kelly. "There’s always going to be exceptions," he added. "I think those were set as guidelines. Bottom line is, 'Can he help you win games?'" Pederson was then pressed on if that is how he differs from Kelly, and the first-year head coach distanced himself further still. "Our first year in Kansas City with coach Reid, we tried to have some of that mentality where we’re going to make the people fit what we do. That was a big mistake," Pederson admitted. "We learned to adapt to the players around us. We learned to listen to guys like Alex Smith. We learned to listen to the Justin Houstons and Tamba Halis and Eric Berrys, and utilize their strengths and weaknesses to help our football team as a whole. "You can’t put yourself in a box that way. By no means do I want to put our roster in a box. As coaches, I want us thinking outside of the box. Challenge yourself every week to – not necessarily reinvent the wheel – but utilize our talent and strengths to help us win games." I won't go as far as to say Pederson took a veiled shot at Kelly, since he was referring to his own experiences when using the phrase "big mistake." Still, he clearly was able to learn something early on that Kelly hasn't been able to see. And that should be welcome news for all the fans who complained about Kelly's stubbornness when it came to his unwavering belief in "his system" and finding certain "prototypes" to play in it. Under Pederson, it seems, that way of thinking will be thrown out the window.